Escape is an action, but on some days, Escape becomes a place. When escape is an action, it is one that moves away from danger, from trouble, from life threatening situations like an angry lion, a bear, fire, an explosion or a place like Lagos. I have written earlier on how Lagos with its endless bustle and hustle can be suffocating, so I won’t go on about that on this post. Experiencing new locations are best done through road trips and this was why I chose to ride an early bus to Abuja as opposed flying. I had my bag packed full. Road travel for me means catching up on some reading. With me I had Noo Saro Wiwa’s “Looking for Transwonderland Travels in Nigeria”, a book reflecting my adventure. A prayer broke out on the bus, prayer for safety but was executed in the most interesting twist. The man leading the prayer inquired “Any Muslim on the bus? If any, please lead us in prayers. I’ll lead a short prayer for Christians after you” a woman took up the request and prayed in Arabic and after her came a Christian Prayer in English. In my mind, I was impressed with the rather unusual yet interesting display of diversity and tolerance playing out before me, one that I had not experienced before. I was impressed until a few seconds after the prayers, a passenger beside the woman began querying her “Why do you people pray in Arabic and not English? How will I know if what you’re saying is best for all of us?” the conversation spiraled into more and more questions, back and forth for minutes into hours flipping from religious to tribal profiling into politics to APC vs PDP and lastly sinking into Buhari. It wasn’t long before words like “bigot!”, “tribalist” started flying in the air, I closed my book and shut myself out of the soft commotion between the two passengers. I woke up later to find the both passengers sharing jokes with a bunch of banana and plate full of groundnuts. I smiled, this right here sums up Nigeria; a cat and dog union of two religions with numerous tribes and ethnic groups, disagreeing on many ideals yet united by land. Nigerians have learned best to exist as strangers in their land, every region sticking mostly to their lane and crossing over to neighboring lanes solely for the purpose of trade, business or the country’s compulsory post graduate community service (NYSC), but hardly for local tourism or adventure. No one told me how long the ride to Abuja was from Lagos. I arrived Abuja at 9:07pm, with a broken back and heavily tired legs; completely drained and stressed. It took me two days of some Abuja rest to recover from the trip and resume my journey to Kano. I left Abuja for Kano at 7am and got to Kano at 11am. Riding from Abuja, I met the iconic Zuma Rock, standing majestically along Abuja — Niger expressway, just before Suleja, Niger state’s most vibrant city. The ride showed an honest transition of a high standard of living to a quick crash into a low. Abuja — Kaduna had lots of greenness, of farms spreading left and right, maize farms, rice farms, groundnut farms, vegetables farms and lots more, all mostly nourished by artificial irrigation channels. More farms decorated the road side along Zaria to Kano. I spotted families under the sun weeding, watering and ploughing the soil. Fathers with their wives and children along with their cows as tractors making a living for themselves. Freshly harvested corn were displayed for sale on tables at the road side, appearing intermittently between rides. I woke up into extra high temperature, hot blazing sun and clearer skies, I was in Kano, I didn’t need to check my phone map to confirm this but I did so anyways, it was above 32°C. I had been warned of a hotter weather, so I was ready. Taking off my jacket, I called my friend who was hosting me “I’m in Kano, let’s get this party started”. He picked me and there began my adventure. I was on a quest to try every food in Kano, to see every place possible, to experience everything experiencable. Entering Kano I felt a sudden strange yet familiar aura, one similar to the air over Benin City and Ibadan — an air of gradually a modernizing past, a tenacious grip unto history and many untold stories. Most architecture around town reflected a blend of precolonial Nigeria style and a conscious preservation of Northern Culture. Radio airplay reflected this blend too; playing typical hindu type Hausa music reflecting eastern influence fused with modern Nigerian Afropop and American Hip Hop sounds. Aware of the vibrant nature of the Northern Culture, I wanted to blend in so I was dressed in Kaftan, an attire which seemed like an unspoken uniform for most males around town. This to me was the most beautiful display of cultural pride, men dressed in Kaftans and Agbadas, women in colourful Ankara prints, with colourful Hijabs. My host pointed to me parts of the ancient walls that surrounded the Kano since 999AD made of baked clay, standing tall, untouched and properly preserved. We passed through one of the 17 gates, leading into the wall protecting the town. I was hungry so we decided to get brunch. For soft landing, I decided to start with something familiar, Jollof rice. Seeing that I was in the North, the heart of Nigerian Agriculture (both Plant and animal), food was cheap, almost free when viewed through the eyes of any Lagosian. For N250 we got a plate of rice, spaghetti, salad and diced beef! (served with spicy sauce), it was unbelievable. The restaurant served other variety of meals, Suya, Wanke (rice and beans), Salad, fresh juice and tea from morning till night. There were lots of tea options from fresh mint leaves tea, to lemon tea, lime tea to lemon grass tea amongst many. 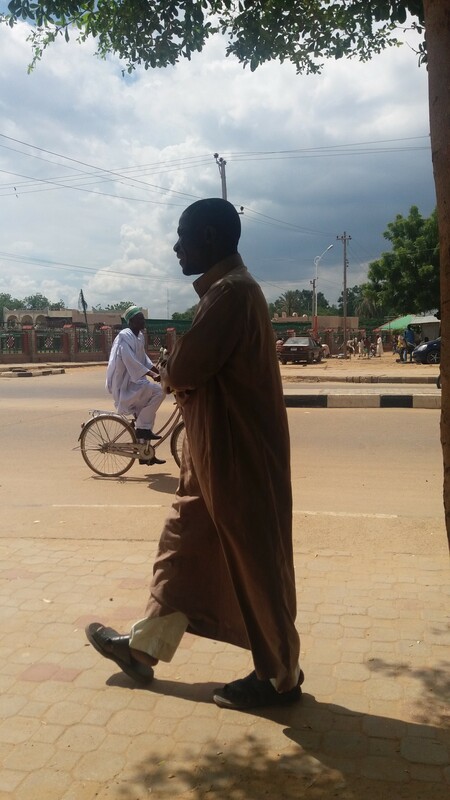 Tea culture in Kano seems to be on fire, local tea stalls stood at many streets corners and it left me wondering if it was the infamous cold weather that blankets the town every other night that was powering this culture or one of the many adopted culture from past Arabian Islamic missionaries. From there I began my hunt for street snacks and new foods, I started with trying Guresa, a flat bread-like meal eaten with Suya. Guresa was every bit of awesome, a filling meal garnished with grated cabbage, onions and Yaji (finely ground groundnut mixed with pepper, seasoning cubes and spices). For desert I had fresh dates and some dry dates but at this point, I was full and my quest to taste everything edible Kano had to offer came to a sudden Halt. After a drive around town and a few errands with my host, we decided to get some rest, the next day promised more adventure and I was ready for it.